The words “devious” and “diabolical” often come to mind when considering Sam Raimi’s genre work. His brand of horror is quite unlike any other, boasting a mile-long mean streak that’s only outpaced by the amount of fun that’s on display. There’s an impish quality to his work that’s become his signature: after all, there’s a reason that “Raimi-esque” has entered the horror lexicon. So it’s easy to why Drag Me to Hell was one of the most anticipated films of the last decade, as it represented Raimi’s return to his old stomping grounds after a 3-movie Spider-Man gig. Even more thrilling was the fact that he didn’t miss a beat: not simply a quaint return to form, Drag Me to Hell provided a blistering reminder that no one still makes horror movies quite like him. There was an air of a king returning to his throne, brandishing his blood-soaked sword like a composer’s baton, orchestrating a gleeful amount of carnage to his own unique time signature. Nearly a decade later, that impression largely holds up. 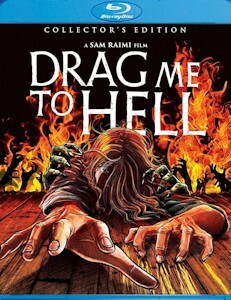 While the novelty of seeing Raimi return to horror (especially since he’s recently resurrected The Evil Dead) obviously isn’t a factor now, Drag Me to Hell remains one of the most deliriously entertaining horror films of the century. It might even be one of the more underappreciated of that era, something that seems impossible considering it hails from an absolute master like Raimi. And yet that’s what repeatedly came to mind during my recent revisit—I recalled truly enjoying the film when it was released in 2009, but time has been especially kind to it, perhaps because the theatrical horror landscape offers up fewer and fewer idiosyncratic efforts with each passing year it seems. From the jump, it’s clearly and indelibly Raimi’s film: who else would dare dream up a prologue that features a boy being literally dragged into hell, almost as if he wanted to quickly confirm the title is no joke? Better yet, who could make such an opening feel like a fun, clever hook into what ultimately feels like a suburban riff on The Evil Dead. In this case, however, his target for splatstick abuse isn’t Bruce Campbell’s Ash but rather Christine Brown (Alison Lohman), a bank loan officer who desperately wants to be promoted to her branch’s vacant assistant manager position. So desperate, in fact, that when an even more anxious customer (Lorna Raver) comes to her seeking an extension on her mortgage, Christine—admittedly with a heavy heart—denies her, citing the bank’s previous grace periods. Enraged, the shunned old woman curses Christine, vowing to take revenge for the poor girl’s unassuming attempt to “shame” her in public. Of course, all of this plays out in very Sam Raimi fashion, with dollops of gross-out gags (the old woman’s constantly hacking up all over Christine’s desk, and this is not to mention her decision to remove her saliva-soaked dentures) and an overwhelming sense of nervous energy just waiting to be uncoiled. It’s an uncomfortable scene in more ways than one: you can’t help but feel bad for Christine (who’s only doing what she assumes her boss wants her to do) and the poor Ms. Ganush here, which establishes the crucial bit of empathy that underlies Raimi’s brand of horror. Paradoxically, his films feel especially cruel because they’re often subjecting good people to abject misery. Drag Me to Hell is no different—in fact, this element might be even more pronounced since Lohman is genuinely sweet in a way Campbell’s lug-headed Lothario isn’t. Furthermore, Christine’s plight requires a bit more unpacking than Ash’s, and Raimi bounds through various sources—from a rookie, roadside psychic (Dileep Rao) to a seasoned medium (Adriana Barraza)—to embellish this tale of demonic vengeance. However, his tale is never bogged down by the exposition, as it effortlessly glides from one outrageous display to the next, each of them in keeping with the spirit of Raimi’s signature demented style. Despite the PG-13 rating, Raimi orchestrates some especially deranged carnage. You sense he’s going to delight in torturing Christine from the moment she has her engage in fisticuffs with Ms. Ganush when the old lady assaults her in a parking garage. It feels so deliriously wrong, yet you can’t help but delight in the sight of it all, an approach that feels like the guiding principle behind Drag Me to Hell. Raimi coaxes laughs, gags, winces, and disapproving nods throughout, whether it’s from having Christine’s nose comically spurt gallons of blood or from having her cat with horrific intentions. Once she’s cursed, seemingly every moment is dedicated to breaking Christine down, sending her on a desperate quest to undo the hex; in typical Raimi fashion, however, that desperation is matched every step of the way by cruel twists of fate that send her swirling down the drain, all of it captured with a manic, feverish energy. His road to hell might be paved with good intentions, but it’s also lined with maggots, blood, and pus. Raimi has always shared sensibilities with the Coen Brothers, at least in terms of finding the dark humor in human foibles and suffering, and that’s pronounced remarkably in Drag Me to Hell. It’s the sort of film where Christine’s attempt to seek out forgiveness from Ms. Ganush has her unwittingly stumbling upon the old woman’s funeral, where she inadvertently tips over the corpse…which proceeds to spit up embalming juice right on her face, naturally. Let the record show that Raimi is also the king of gore-soaked grace notes. There’s little doubt Christine doesn’t really deserve this, but can you really refuse to laugh at her misery when it also involves a possessed, talking goat during the film’s show-stopping séance sequence? I refuse to acknowledge such people even exist, and it’s pretty obvious Raimi banks on that too, especially since he can’t help but carry out Christine’s cruel death sentence to the film’s bitter end. Somehow, it’s all hilarious, screwy, and kind of heartbreaking all at once. Again, Christine is a sweet girl with a terminally nice boyfriend (Justin Long), and her only mistake is misguided ambition fueled by the capitalist machine. In retrospect, Drag Me to Hell is a perfect reflection of Recession-era anxieties, as it charts the fallout of a war between the middle and lower classes; you can’t help but notice that the real villains—Christine’s boss and her brownnosing rival co-worker—aren’t punished nearly as severely as she ultimately is. Then again, it seems just as likely that Raimi sees this operating a more cosmic, karmic level: sometimes, bad things happen to good people—but who’s to say there isn’t some fun to be gleaned from kicking them while they’re down? This week in “We’re All So Very Old” brings news that Drag Me to Hell is now the sort of film that earns (and totally deserves) a Collector’s Edition retrospective release from Scream Factory. While this designation is typically reserved for older classics, the label has been dipping into more recent fare lately, and this is the latest such effort. It’s a solid one, too, as Scream has lavished both the theatrical and unrated cuts with new HD masters, with the latter obviously proving to be of interest here since it adds a touch more gore to the proceedings (though your mileage certainly may vary in respect to the infamous cat scene). They’ve also ported over the extras from the previous Universal release, which already boasted over an hour of material between the on-set production diaries and interviews with various members of the cast and crew (including Raimi himself). While it’s disconcerting to see these referred to as “vintage” features, they’re informative nonetheless, and provide a reminder that Universal pretty much did right by this title when it was originally released. Notably absent since that release has been a commentary of any sort, and I’m guessing that’s been a sticking point for some enthusiasts, especially since Raimi isn’t adverse to recording tracks. For whatever reason (I have to imagine he’s busy as hell, though, which is my guess), that gap still hasn’t been filled for this release. Instead, Scream did produce 45 minutes of new interviews with Lohman (who sadly hasn’t acted very much during the past decade), Raver, and composer Christopher Young. Lohman and Raver both fondly remember their time on set, with each taking time to compliment Raimi as a director (particularly his willingness to work with his actors instead of dictating to them—he seems like a genuinely great guy). Of course, each actress had a very different dynamic with him on set: for Lohman, she admits she was essentially stepping into Bruce Campbell’s shoes as Raimi’s new tormented collaborator, a role that required rigorous workdays and a willingness to be subjected to the whims of a madman. Raver, on the other hand, assisted in the tormenting, delighting in her on-screen rivalry with Lohman every step of the way. Young, too, is expectedly complimentary of his director, with whom he had already worked twice before at this point. Interestingly enough, though, the composer claims he’s wanted to collaborate with Raimi ever since The Evil Dead blew his mind, one of those cool anecdotes that reminds you that these professionals are often every bit the geeks we are. Scream Factory has also included the original promo material (TV spots, a theatrical trailer), plus commissioned new artwork (which can be reversed if you prefer the original art). More than anything, this is a welcome release if only because it helps to solidify Drag Me to Hell’s well-deserved place in the new canon, so to speak. Also, not that you ever really need an excuse to revisit a Sam Raimi movie, but this provides a damn good one all the same. You may even find that it’s even better after all these years. I would certainly argue that case because I have to be real: when Drag Me to Hell was first released, I still couldn’t help but wish Raimi would channel that kind of energy into Evil Dead 4. Now that he’s done that (and then some), it’s not nearly a concern, so Drag Me to Hell is free to flourish completely on its own terms. I know that’s probably not fair and sounds silly, but it’s a reminder that sometimes we bring stupid baggage to things. Letting go can be cathartic, especially when it involves Sam Raimi battering a character with a corpse for your amusement.